From time to time, I highlight an adult book that is related to nurturing young readers. In February, I showcased 15 Minutes Outside and a variety of outdoor literacy activities. 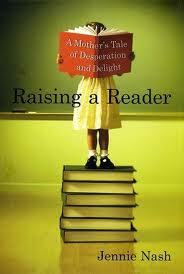 Today, I’m excited to present Raising a Reader by Jennie Nash. Raising a Reader is a very easy, entertaining and informational story of one mother’s quest to create avid readers within her two daughters. It is an honest look at how her strong desire to create this love is both rewarding and at times a little desperate. Her chapter titles include, “Perspective”, “Obsession”, “Abundance” and “Perseverance”. Each chapter ends with a tip on something that the reader can do with their child. Nash’s first chapter is titled, “Passion”. More than anything, she wants her children to grow up with a passion for reading that equals her love of the subject. I sooo relate! Currently, my boys have more books than they have toys and I hope that it always remains that way. Nash recommends spending time each day to read with or to your children. She likes snuggling up in her bed to read with her kids each night. In the “Abundance” chapter, Nash talks about every reader needing material to read. She and her girls take bi-weekly trips to the library to load up on bedtime reads. Her girls loved securing their very own library cards. This is such a treasured time for her family. I too remember my trips to our local library and thinking that it was such a treat to pick out books to borrow from so many choices. I recently read this quote from Gallagher that fits nicely with this topic, “Guess what happens when you put 2500 books in your classroom, kids read them! A swimmer needs water.” Children need an abundance of reading material. I must admit that this chapter made me a bit weepy because I now live in a community that does not have a free public library! I can’t believe that the children in my community don’t have a place to access an abundant amount of free books. I so want my boys to have the library experience. More on this topic in a future post! Nash’s chapter, “Delight”, points out that children are delighted by words. I know my oldest son loves “sound words” such as kaboom, crash, bang and boom. He has squealed in delight for months now when you say these words to him. Nash suggests doing word play with your kids in everyday places such as the car. She and her girls make up new lyrics for familiar songs. Getting your kids excited about words, will increase their reading ability. At the end of this short read, there are several useful lists including “Great Books to Give for a Baby Shower”, “Books to Read Aloud on a Rainy Day by Firelight”, “The First Series My Kids Loved to Read on Their Own”, and “Books I Wish I Could Convince My Kids to Read”. Raising a Reader is an inspiring and supporting resource to help us nurture our youngest readers.